Merrily We Roll Along Toward Fall Gardening | Does This Font Make Me Look Fat? Our area is rich in talent. On Sunday, Laura, my husband and I went to the Oxford Community Center to see Merrily We Roll Along. We went mostly because Laura’s nephew, Sam Stenecker was the lead in the show. And Tally Wilford was the director. Tally manned the light boards for the Avalon production of our play, The Santa Diaries. It’s always fun to see people you know in a show, and I don’t know why I am always stunned at the local talent. Merrily We Roll Along is a musical with music and lyrics by Stephen Sondheim. The book is by George Furth. I have to say I’m not a huge Sondheim fan. I don’t find myself humming the melodies, but the lyrics are another matter. The songs and the play made us think about the choices we make in life and the results. The cast was terrific with some exceptional voices. It has been so interesting to watch Laura’s nephew, Sam, mature as a performer. He’s grown from a gangly adolescent into an actor with presence and leading man looks. His acting is top notch and his voice superb. Directory Tally Wilford has had theater in his blood since he was a kid. At sixteen he founded the Underground Actors. He and his group have been producing plays ever since. The play starts in 1976 with the characters in middle age at the peak of their careers and moves backwards in time to 1973, 1968 and 1966. We see the choices the characters make which don’t lead them to happier lives. Definitely a play to discuss at dinner after… which we did by enjoying a corner booth at Scossa in Easton. Laura got an order of veal meatballs to take home to her hubby who was getting in later that night from a flight. I pulled out the eight Roma tomato plants out of my bed at the St. Michaels Community Garden. Enough is enough. I still have a couple of plants at home, but they are history this weekend. In the meantime I continue to can tomato sauce and gift it to friends. Fall plants go in tomorrow. 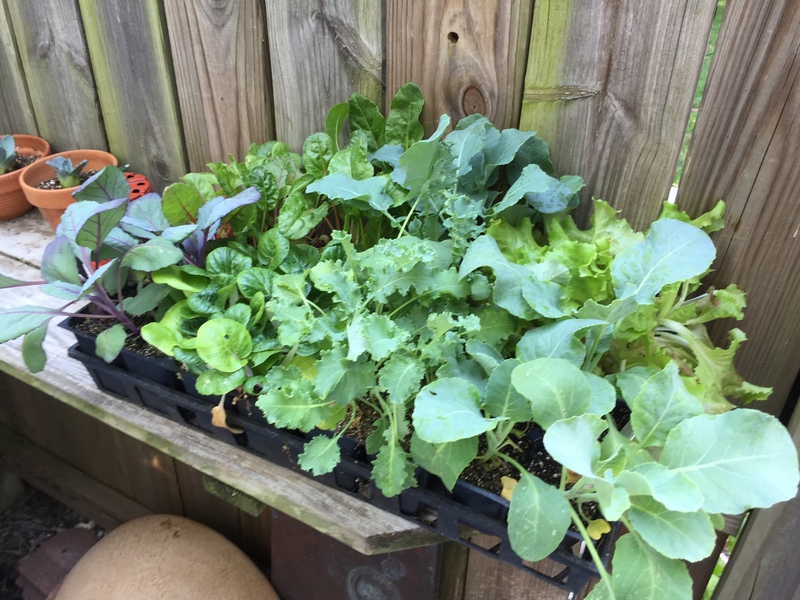 Chard, cabbage, kale, cauliflower, and lettuce. I’ve also planted some seeds, but am hedging my bets with nursery starts. The nights are getting cooler and seed germination gets tricky. 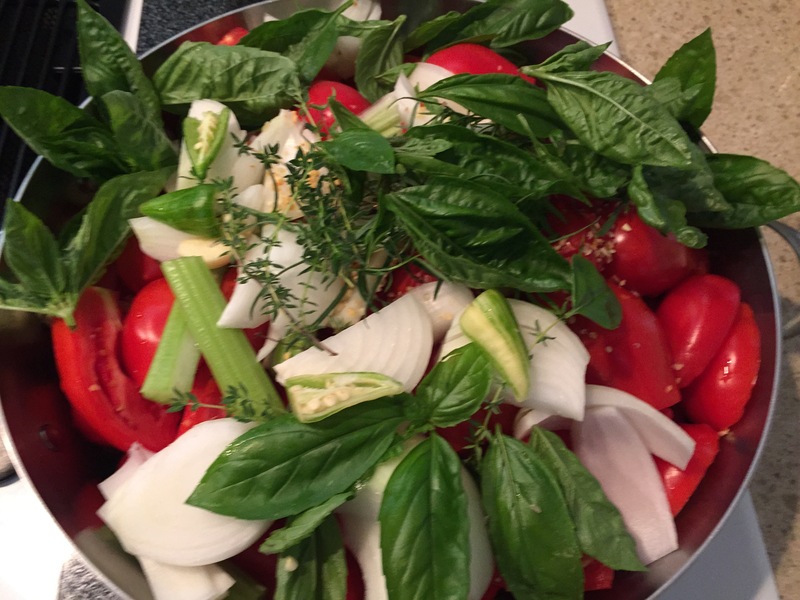 This entry was posted in Cooking, Gardening, Mala Burt, Raised garden beds, Theater, Uncategorized and tagged canning tomatoes, community garden, fall plantings, Merrily We Roll Along, raised beds, Sam Stenecker, Sondheim, St. Michaels Community Garden, Tally Wilford by Mala Burt. Bookmark the permalink.